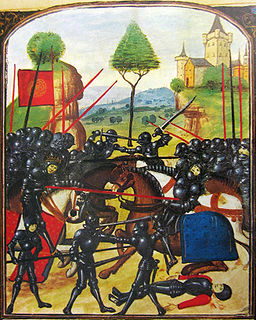 The Battle of Mortimer's Cross was fought on 2 February 1461 near Wigmore, Herefordshire (between Leominster and Leintwardine, by the River Lugg), not far from the Welsh border. 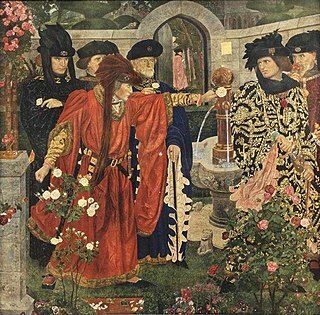 It was a major battle of the Wars of the Roses. 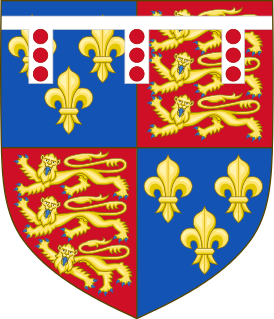 The opposing forces were an army led by Jasper Tudor and his father, Owen Tudor, and other nobles loyal to the King Henry VI of the House of Lancaster, his Queen Margaret of Anjou and their seven-year-old son Edward, Prince of Wales on one side, and the army of Edward, Earl of March. Some sources say it was fought on 3 February, and the exact location has been the subject of some speculation. 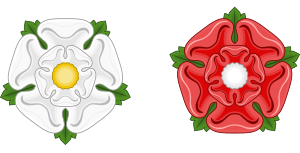 Upon the death of the Duke of York at Wakefield the previous December, the Yorkists were led by his 18-year-old son Edward, now 4th duke of York. He sought to prevent Lancastrian forces from Wales, led by Owen Tudor and his son Jasper, Earl of Pembroke, from joining up with the main body of Lancastrian forces. The elder Tudor had been second husband to Catherine of Valois, widow of Henry V; their sons, as Henry VI's half-brothers, had been made earls, and the family became a major power in South Wales. His army included Welshmen, drawn especially from the area of the Tudor lands in Carmarthenshire and Pembrokeshire, along with French and Breton mercenaries and Irish troops led by James Butler, Earl of Wiltshire and Ormond. Edward, based at Wigmore Castle had gathered his army from the English border counties and from Wales. Among his leading supporters present were Lord Audley, Lord Grey of Wilton, Sir William Herbert of Raglan, Sir Walter Devereux and Humphrey Stafford. After spending Christmas in Gloucester, he began to prepare to return to London. However, Jasper Tudor's hostile army was approaching and he changed his plan; so as to block Pembroke's advance and block him from meeting up with the main Lancastrian force which was approaching London, Edward moved north with an army of approximately five thousand men to Mortimer's Cross. As dawn broke, the meteorological phenomenon known as parhelion occurred: three suns were seen to be rising. The appearance of this sun dog so soon before the battle seems to have frightened his troops, but Edward of York appears to have convinced them that it represented the Holy Trinity and that therefore God was on their side. He later took it as his emblem, the "Sun in splendour". The event was dramatized by William Shakespeare in King Henry VI, Part 3(See below) and in Sharon Kay Penman's The Sunne In Splendour. One of York's advisers, Sir Richard Croft, a local lord from Croft Castle, recommended positioning archers at the crossroads (now the A4110 and B4362 junction) in order to halt the Lancastrian advance. Pembroke's army was about a thousand men smaller than York's and, being untried in battle at that point, may not have originally planned to fight but by midday it was clear that they would have to in order to cross the Lugg. The Lancastrians commenced the attack – Butler's ‘battle’ (division) led the first assault forcing Edward's right wing to retreat across the road, where this flank dissolved. Pembroke faced Edward's centre division and was held off but, most decisively, Owen Tudor attempted an encirclement of the Yorkist left wing; his ‘battle’ was defeated and a rout commenced. Pembroke's centre then also broke and the battle was won. Owen Tudor's men were now in full flight: some of them were followed as far as Hereford, approximately seventeen miles, and where Owen was himself captured and beheaded. The battle having intruded on York's plans to march to the midlands, Richard Neville, Earl of Warwick, with the captive King Henry in his train, was meanwhile forced to move to block Margaret's army's route to London on his own. He took up position north of St Albans astride the main road from the north (the ancient Roman road known as Watling Street). Although he lost the battle that followed, and Margaret of Anjou and her army could now march unopposed on to London, they did not do so. The Lancastrian army's reputation for pillage caused the Londoners to bar the gates. This in turn caused Margaret to hesitate, as did the news of the Yorkist victory at Mortimer's Cross. The Lancastrians fell back through Dunstable, losing many Scots and Borderers who deserted and returned home with the plunder they had already gathered. Edward of March and Warwick entered London on 2 March, and Edward was quickly proclaimed King Edward IV of England. Within a few weeks he had confirmed his hold on the throne with a decisive victory at the Battle of Towton. Conventional sketch maps of Mortimer's Cross show the armies facing each other across the valley with the River Lugg at the rear of Edward's Yorkist army. This almost east/west alignment is partly based on the supposed approach routes of both armies. It has been pointed out that this would mean that Yorkist Edward had the river at his back, an obstacle which would invite disaster if the Yorkists were either pushed back or routed. His fleeing men would be cut down from behind while trying to wade the shallows. Edward was known to be militarily astute (or at least well advised) and he is likely to have been well aware of this risk. Writing for Hobilar, the Journal of the Lance and Longbow Society  Andy Lamkowski suggests that a second battlefield alignment is quite plausible; that Edward drew up across the valley with the River Lugg on his left (with the Yorkists facing almost south) and the Lancastrians drew up facing almost north with the river on their right. The narrowness of the valley close to the bridge would probably mean that the two armies each drew up in a column of three divisions - if they fought close to the river crossing - but the ground widens significantly towards the present Battle Acre Cottage and Drybridge House. At that point a traditional 'three units' battle line is possible. Author Andrew Boardman  also suggests that an alternative interpretation is possible saying: "It may be safe to assume that the battle was fought somewhere in the vicinity, possibly with the river securing the flanks of both armies and the hills the other". Andrew Boardman also quotes William Gregory (Gregory's Chronicle) saying that Edward: "Met his enemies on a fair plain near to Mortimer's Cross, not far from Hereford East". The usual placing of the battle in the valley beside the bridge is not 'a fair plain' but the area around Battle Acre Cottage or Drybridge House - to the south-south east - meets that description. Andy Lamkowski also makes the point that if the Lancastrian force approached from the south rather than the west then a north/south alignment is more likely, Edward would be deploying across the valley width to prevent them moving north and would have the advantage of anchoring his flanks on the slopes of the narrowing valley and/or the River Lugg itself. However, Shakespeare omits any mention of the following battle. ^ Michael Hicks, The Wars of the Roses, (Yale University Press, 2012), 161. ^ a b Charles Ross, Edward IV, (University of California Press, 1974), 31. James Butler, 5th Earl of Ormond, 1st Earl of Wiltshire was an Anglo-Irish nobleman and soldier. Butler was a staunch Lancastrian and supporter of Queen consort Margaret of Anjou during the Wars of the Roses. He was beheaded by the victorious Yorkists following the Battle of Towton.